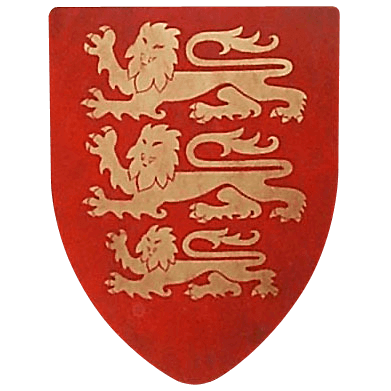 Born at Beaumont Palace, Oxford, September 8th, 1157, Richard was the third son of Henry II and his wife, Eleanor (Plantagenet) of Aquitaine. After the birth of their youngest child, John, Richards parents went their separate ways. Queen Eleanor returned to her native Aquitaine, taking Richard with her, there establishing her own court and designated him her heir. Richard was known to be fond of music and clothing. He was born in England yet spoke little English, his native language was French. He had the infamous Plantagenet temper and he and his elder brother, Henry, joined forces in rebellion against their father, King Henry II. His mother attempted to join them dressed as a man and was imprisoned for the remainder of Henry IIs reign. The untimely death of young Henry made Richard the heir to the entire Angevin Empire. Richard refused to share his lands and inheritance with his brother John. The family disputes raged on. In the meantime, Richard learned of the loss of the Holy City to the Moslem leader Saladin and proceeded to take immediate action. Upon the death of King Henry II, Richard was crowned King of England. During his coronation that took place in Westminster Abbey on the 23rd of September 1189, a bat was seen to circle around the Kings head. Many witnesses saw this as an evil omen. Freeing his mother from the imprisonment imposed by his father was one of Richards first endeavors as king. His second action was to raise funds for his crusade to restore Christendom to the Holy City. He made a solemn vow to free Jerusalem. He levied a tax on his people called a Saladin Tithe to aid his war effort. This movement is known in history as the Third Crusade. Richards crusading spirit and reputation for being brilliant and courageous spread through Christendom, earning him the name Coeur de Lion (Heart of a Lion). Returning from the Crusades in 1192, King Richard the Lionheart had disappeared. His actions during the crusade angered many. He was captured and imprisoned by Leopold of Austria then sold to the Emperor of Germany. Legend has it that the Lionhearts minstrel, Blondel, journeyed in search of his king. Blondel heard his king singing in a castle and responded with a song that only they were sure to know because the two had composed it together. The facts show that a ransom was offered in the sum of 150,000 marks (equivalent to 2 tons of silver) and was backed by the Pope. Shortly thereafter he was released upon payment. Richard only served six months out of his entire reign in England. It is said that he complained that it was cold and always raining. Richard the Lionhearted Plantagenet is more famous for his part in the Crusades than his reign as king. His love of fighting and wealth is the most famous of his dispositions. He is said to have cried, I would sell London, if I could find a purchaser. This replica medieval shield is constructed of 16 gauge steel. The shield size is 18 inches wide by 24 inches high and it has a curved shape. It is the classic heater style battle shield. Richard Lionheart shields are hand-painted and then sprayed with a protective layer of polyurethane to preserve the artwork. 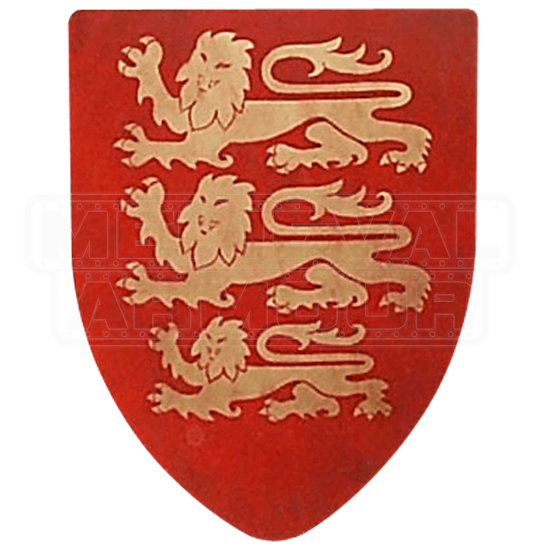 The Richard Lionheart shield is available in either a wall display version with a chain from which to hang it or a hand held, battle-ready version with heavy duty, 1.5 inch leather straps on the back. Order the Richard Lionheart shield version you desire above.